Anti-corruption group, Transparency International (TI) Ireland has published its first report based on data collected from over 500 whistleblowers, witnesses and victims of wrongdoing in Ireland. 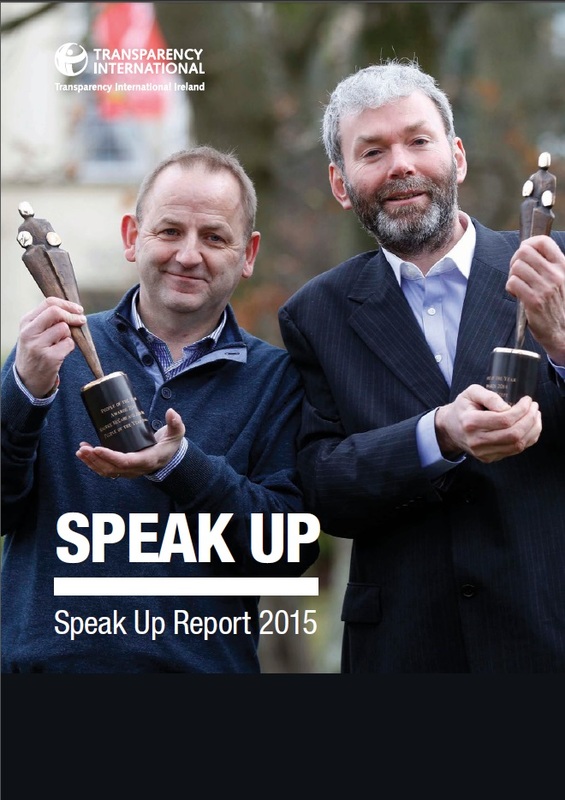 The Speak Up Report suggests that the risk of corruption and other forms of wrongdoing is relatively high in Local Government and the Health Service, as well as Social Services including Charities, but TI Ireland’s Chief Executive John Devitt has warned against assuming that these sectors are more ‘corrupt’ than others. 'The report is not a league table of the most and least corrupt organisations or the most honest counties in Ireland. Instead, we’re highlighting the kind of risks that policy makers and senior executives need to be aware of and the measures we think will help address corruption, fraud and other forms of wrongdoing. No organisation or professional sector is immune from malpractice,’ Mr Devitt said. Susheela Math, TI Ireland’s Legal Counsel and manager of the Speak Up helpline, said ‘Whistleblowers, in particular, play a valuable role in bringing wrongdoing to light and preventing it from happening again. However, we have heard from our callers that they have often been penalised for speaking up. ‘Our report contains a number of issues to be reconsidered as soon as possible or at least when the Act is reviewed in 2017. These include providing explicit protection for volunteers, expanding the list of prescribed persons (regulators) who can receive reports, and making actions for compensation less burdensome,’ Ms Math added. The report lists the ten sectors that have been the subject of most concern among helpline callers. Particular attention is paid to the top three sectors highlighted by callers: Local Government, the Health Sector and Social Services including Charities. The report identifies planning and public procurement as key risk areas for local authorities, while the high rate of whistleblower retaliation in the Health Sector (at 20% of calls) is highlighted as a source of concern. TI Ireland also point to the relatively large number of complaints about medical malpractice and allegations of cover-ups in the health service. Social services including Charities represent the third highest number of reports to the helpline. It is suggested that this is likely to be a result of the growing overlap of responsibilities between state and non-profit services as well as a lack of financial oversight in the sector. Dublin is listed as the source of the most number of reports, followed by Cork, Kildare and Donegal. The higher concentration of population in both Dublin and Cork is likely to account for the larger number of calls from the two counties. Proactive intelligence sharing among law enforcement agencies and other state bodies needs to improve if corruption and white collar crime are to be properly detected and prosecuted. Either a national anti-corruption agency or an inter-agency task force on corruption and white-collar crime should be established. Such a measure should be introduced as part of a long-term national strategy aimed at preventing corruption and white-collar crime. While Local Government auditing standards appear to have improved in recent years, there appears to be little or no promotion by local authorities of their statutory Fraud and Anti-Corruption Alert Plans. Promotion of these and other anti-corruption measures, including training and education, should be introduced as part of an overhaul the local government ethics framework. Increase education and awareness-raising on corruption and anti-corruption across all sectors. More emphasis should be placed on education and awareness-raising on the risks and costs associated with corruption and measures aimed at stopping corruption across Irish society. This should include sustained public-awareness raising initiatives involving civil society organisations; ongoing ethics training and advice for public officials including elected representatives; and continuous research on the efficacy of existing anti-corruption measures. Any changes to national ethics legislation should introduce a ban on any public official receiving gifts or entertainment during the course of their employment. Any new requirements to make declarations of interest should also cover any liabilities, as well as income and assets of public officials and their families. The Protected Disclosures Act will not protect whistleblowers on its own. TI Ireland will launch a new initiative in 2015 titled ‘Integrity at Work’that will bring employers, trade unions and regulators together to subscribe to standards by which workers will be treated when speaking up about wrongdoing. The initiative will allow workers to approach the Speak Up helpline in seeking legal advice and for TI Ireland to monitor employer or regulator compliance with the Integrity at Work standard. The goal is to move beyond the law and ensure that employers and workers are able to make the most of the new legislation. TI Ireland will also announce plans to launch its National Integrity Award, which will recognise people and organisations that have made an outstanding contribution to the public interest by exposing wrongdoing or promoting transparency in public life. The award is due to be formally launched this summer. The Speak Up helpline is one of around 70 Transparency International (TI) Advocacy and Legal Advice Centres around the world and was the first to be established by TI in Western Europe. TI has now provided support to over 130,000 people worldwide.